Upcoming Event: 32nd Annual Sheep Shearing Festival, an event you won’t want to miss! 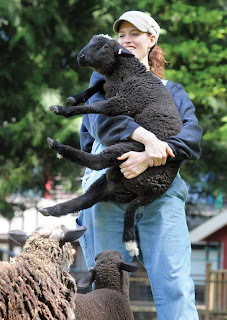 Visit Maplewood Farm at 11:00 am or 1:00 pm on Sunday May 27th 2012 to check out the shearing of Maplewood flock by Professional Shearer Lorea Tomsin of Sidney, BC. Bill McCallion of Whonnock, BC will also be on-site with his talented Border Collie dogs and special ducks. Craft tables and weaving demonstrations will take place all day outside. If the weather doesn’t cooperate, the craft tables and weaving demonstrations will move inside the red livestock barn. Contact us at info@maplewoodfarm.bc.ca for more information. Starting Saturday May 26th, 2012 on a weekly basis from 10:00 am – 3:00 pm visit the Farmers Market at Maplewood Farm. A farm visit is not required to access the market. The market will occupy the south end of the farm’s parking lot. Additional parking has been secured across the street at the school (32 additional stalls plus the gravel field). Book Your Classroom/Daycamp Field Trip! The farm is a fabulous outdoor classroom making school/daycamp field trips to Maplewood Farm an experience to remember while reinforcing classroom teaching. Teachers and Daycamp Leaders are welcome to download the Guide to Maplewood Farm (pdf) to help with their trip planning. Reservations are required and we recommend you make arrangements at least two weeks prior to your visit. Contact us at info@maplewoodfarm.bc.ca or call 604-929-5610 to book your field trip today! Check out the new and improved farm!